In the year 1889 the late LeBaron D. Ruddock of Buckland died, leaving a legacy for the nucleus of a church library fund. Reverend Alpheus C. Hodges, a man of vision, saw here an opportunity to stress the need for a public library building. He therefore offered to give one thousand dollars if the people in town would raise a like amount. A committee consisting of Messrs. E. C. Maynard and A. C. Hawks soon secured the required sum and the lot whereon the Methodist church stood [this is the library’s current location on Upper Street, Buckland Center] was decided upon as the most central location for the building. As the Methodist society was greatly depleted in numbers, and the church no longer used for services, the Methodist conference sold the property to the citizens for use as a public hall, and it was moved to the rear of the Congregational church [where it stands today known at the Buckland Public Hall available to rent for private and public functions]. The ground thus cleared, was purchased of Josiah Griswold’s estate for the site of the new library. The building committee was Sumner J. Ward, James D. Avery and Charles E. Ward. The committee on plans and specifications, Reverend Alpheus C. Hodges, secured the services of Gardner, Payne and Gardner, who prepared and submitted the same for approval. The interior of the library is a single room 25 x 36 feet, finished in natural wood. In one end is the large fireplace, embellished with a memorial tablet. Bookcases line the walls and the center of the room is given over to reading tables. The frame of the building is of slow burning mill construction type, walls of brick, roof of slate. At the time of building, the library comprised two thousand volumes, many of which had been given by Mr. Hodges. E. C. Davis, civil engineer of Northampton, gave two hundred volumes as a memorial to his parents, whose lives were spent in Buckland. The books included forty volumes of Shakespeare, Emersons’ and Dickens’ works, and books of like character. Albert Ward of Taunton, but of Buckland origin, presented a picture, “The Angelus,” which found a place upon the walls. The church library was moved from the Congregational church into the new building. The dedicatory exercises of the Free Public Church Library, as it was first known, took place July 4, 1891, at the Congregational church. An address was given by Hon. E. B. Hayes of Lynn. There were appropriate remarks by George D. Crittenden of Shelburne Falls, Edward P. Hitchcock of Greenfield, Frederick Howes of Ashfield, Miss Louise Hodges, Hon. W. A. Clark of Lynn, and S. E. Bridgeman of Northampton. After prayer by Rev. Ashley of Shelburne Falls the audience proceeded to the library building for further exercises. These consisted of a brief dedicatory address by Rev. A. C. Hodges, a prayer by Rev. C. B. F. Pease of Ashfield and singing of the Doxology. Letters of congratulation were received from Rev. Dr. Theron H. Hawkes of Springfield, Hon. C. B. Tillinghast, State Librarian, President Merrill E. Gates of Amherst, and many others. The first librarian was Miss Clara Bement. For twenty years the church bore the expenses of the Free Public Library. 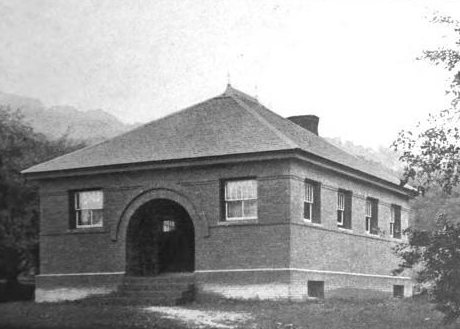 The members of the Congregational church voted on December 26, 1911 to give the library committee the authority to place the library in the charge of the Town of Buckland. An agreement was finalized on August 31, 1912 between the town and the church with conditions that included that the books remained the property of the church but the town had free use of the books and the building, and that the town pay for ordinary repairs and all maintenance expenses. The Library remained under the ownership of the church, with trustees appointed by the church and the town, until September 2002, when the church membership voted to convey the library building, land and all its assets and funds to a new nonprofit secular organization, The Buckland Public Library, Inc.